The U of R has a unique student employment program because the majority of work-study dollars come from University funding, not just federal funding, allowing for greater student participation. Eligibility, based on demonstrated need, is determined by U of R Student Financial Services. Students in the work-study program can work up to 10 hours per week on or off campus, so long as they are enrolled full-time. At the beginning of each semester, students have the choice to return to their position or seek new opportunities. Some students even have the option to work for their department full-time over the summer while living on campus. I did this last summer, and it was such a great experience that I’m doing it again this summer. Looking back, attending that workshop in Casa Loma seems like a lifetime ago. I learned what it meant to be granted a work award, I signed up for a time to speak with the Office of Student Employment, and I was given a large packet of available work-study positions to sift through. The process of finding a position is more digitized now, but this helpful workshop is still held for new students during Orientation Week every year. I recall flipping through that packet of jobs, already knowing I wanted to work in Armacost Library. I loved books; there was no other option for me. I did come across a news assistant position in some department called University Communications—whatever that was—and even though I was planning to major in creative writing and had experience writing for a newspaper, I wasn’t sure I was qualified. With some trepidation, I agreed, and set up an interview at University Communications with a woman named Patty. “We’re located on the first floor of the Administration Building,” she informed me. On the day of my interview, I made my way up to Admin, writing samples clutched in my shaky hands. Shocked to find that the enormous building had a side door, I managed to find UComm (why did it have two offices?) and what seemed at first glance to be a large number of employees. Patty was all effervescent smiles, and our interview went smoothly. She let me know that she still had one more candidate to interview but that she would call me by the end of the week. Since then, it has been a whirlwind four years. During my first year at UComm, I learned how to write press releases, as well as how to nicely ask telemarketers to stop calling (although my efforts were futile). The office experienced a lot of employee-related changes that year, and, amidst the chaos and confusion, I was tempted to quit, but decided to stick with it. That was one of the best choices I’ve ever made. In the fall of my sophomore year, I became marketing assistant to a new supervisor, Katherine. She taught me about budget management, and I taught her about Microsoft Excel, and we worked great together. It was near the end of that school year when the “creative” (i.e. graphic design) side of UComm, in the office across the hall, finally got a much-needed renovation. The creative team temporarily relocated to the editorial/marketing side where I worked. We had a combined dozen employees and student workers at that point, so the lack of elbow room definitely helped us get to know each other better. When I returned that fall, the creative team had a shiny new office, and I entered into a somewhat strange transition that came with my decision to double major in creative writing and studio art (with an emphasis in graphic design). The UComm team felt I’d be well-suited to a more graphically oriented position, and I agreed. I still filed invoices, but I also started going on photoshoots and taking headshots. When Katherine left UComm for a new opportunity across the country (I’ve forgiven her now), I received the title of photography assistant and two new supervisors, Mika and Jen. My new position combined both the editorial and creative sides of the department, as I often captured visual content for the Och Tamale alumni magazine. When I started doing more writing for Mika, the editorial director, I finally transitioned into my current position as multimedia assistant. 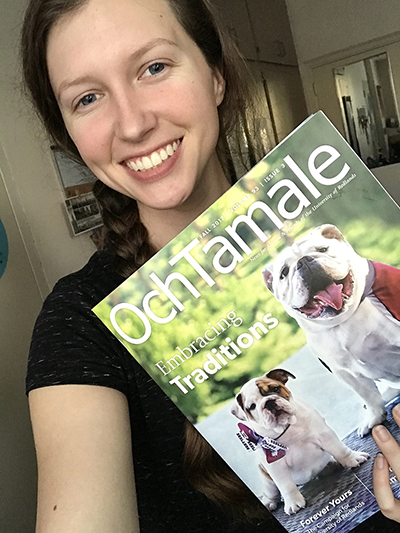 Matousek poses with the Fall 2017 issue of the Och Tamale, which features her photo of the bulldog mascots on the cover. My title is quite fitting: not only do I write and take photos for the Och Tamale and the Bulldog Blog, but I also get to take photos of Addie, our live Bulldog mascot; design various print and digital pieces for prospective students, donors, and alumni; assist with social media; try not to panic when webpages crash; and everything in between. I’m very lucky to have had a Work-Study position in my field that provided me with so much “real world” experience, and I couldn’t be more grateful for my time here. My coworkers are more than just the people I work with—they’re my friends and somewhat dysfunctional family. We’ve gone out for lunch and coffee together, and we even took a trip to explore downtown LA last summer. Jen, Juan, and Michelle have offered critique and help with my portfolio, along with an endless supply of graphic design books. Jaye has filled the few remaining empty spaces in my brain with Star Wars trivia and dad jokes, and Katie has shown me all the best places in town to wine and dine. Brittany and Stephanie have eagerly listened to me talk about my latest crush, Lille and Monique have provided a plethora of travel advice, Mika and Jenn have both mentored and mothered me, and Wendy is the glue that keeps us together. My fellow student worker, Rebecca Bayer ’18, stuck with me through all four years, and we gained new friends among our fellow student workers along the way: Nathan, Simone, Olivia, Greta, and Elias. Everyone contributes to UComm, all while learning new things every day. I’m still in touch with several UComm employees of the past who have moved on to different careers. 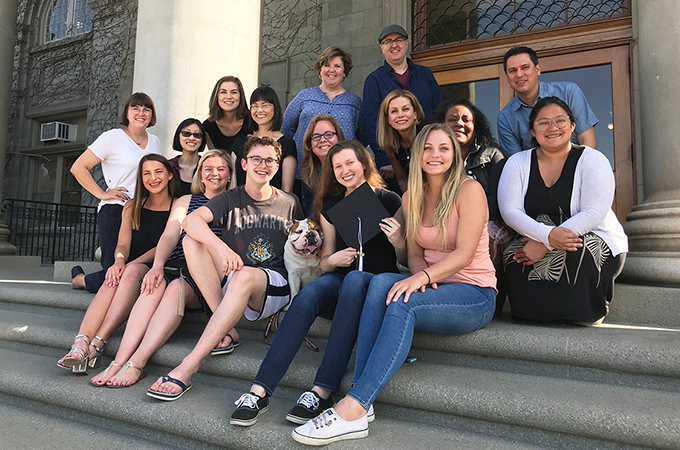 My experiences at UComm wouldn’t have been the same without Patty, Yvette, Ryan, Katherine, and others who offered their mentorship, showed me the ropes, and encouraged me to do my best work. Without work-study, I wouldn’t have been able to afford to finish my education at Redlands. 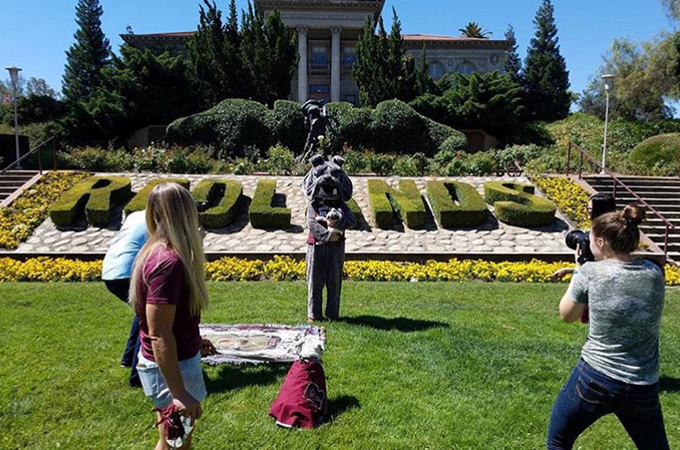 Equally important, I wouldn’t have met a huge portion of my Bulldog family, and I wouldn’t have gleaned the experience that I’m finding to be more and more important as I seek my next employment opportunity. My time at UComm has truly been a gift I wouldn’t trade for anything, and I’m not quite ready to say goodbye. To learn more about work-study opportunities at Redlands, visit Student Employment.